Pares or beef pares is one of the popular dish which is equivalent to braised beef. 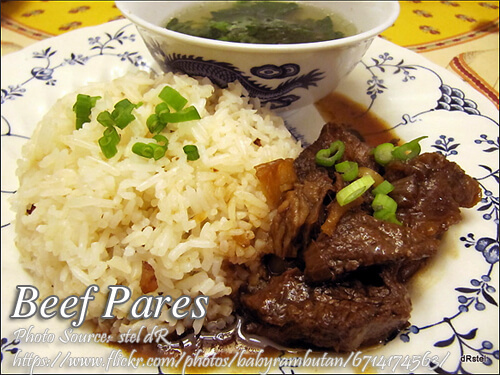 “Pares” literary means “pair” which is a combination of braised beef or beef stew as a tasty viand and a bowl of soup. Commonly it is served with fried rice or garlic rice. Actually there is nothing very special about the dish but it seems that it is very popular. There are many food establishments that I see serving this dish specially in small eateries along sidewalks. It think the reason why is so popular is the convince and simplicity aside from the good taste of course. It is similar to “tapsilog” where everything you will eat is in a single plate. The fried rice is molded in a cup and poured some beef stew on the side. And a bowl of soup to accompany the dish. Pares or beef pares is one of the popular dish which is equivalent to braised beef. Boil the beef briskets in a pot with water, salt and onion. Remove the scum and cook until tender. Transfer the meat to a bowl and set aside. Don't throw away the soup stock and set aside also. In another pot or deep pan, saute the ginger, garlic and onion. Put the boiled meat and stir fry for a few minutes and season with soy sauce, brown sugar, star anise and pepper. Pour about 2 cups of soup stock. Simmer for about 5 minutes. Add the cornstarch mixed with a little water to the pot to thicken the sauce. Season with sesame oil and transfer to a bowl. Garnish with fried toasted garlic. Serve with garlic rice and soup stock garnished with scallion. At last I found a good and easy recipe for this. 🙂 Thank you!!! Hi Evelyn, great! I hope you also try other recipes. Thanks for your comment! Hi Yeshua, thanks for visiting this blog and I trying to cook the beef pares dish! Hi Yam, You are welcome! Thanks Manny for sharing your beef pares recipe, Im planning to add this menu on my eatery. God bless. Hi Karen, you are very welcome! Hoping for more success in your business! thank you for sharing this recipe. i’m trying it out today. Hi Joan, thanks for visiting this blog and good luck on your cooking! Hi, i tried this Beef Pares today and it was a success! I will surely check out your other recipes. Hi Wynes, thanks for sharing your experience! Cheers!